Retinol is a form of vitamin A that is in the family of ingredients called retinoids. A powerful anti-aging ingredient, retinol fights wrinkles and fine lines, brightens skin tone and texture, and diminishes uneven hyperpigmentation. Here's everything you need to know about this skincare miracle worker. Retinol minimizes the appearance of wrinkles, increases skin's thickness and elasticity, slows the breakdown of collagen, and evens out skin tone and texture. Retinol does all this by encouraging surface skin cells to turn over and die rapidly so that new skin cells can grow underneath. While retinol may cause peeling and redness in the first few weeks of use, it actually thickens skin. By thickening the deeper layer of skin, retinol reduces the appearance of fine lines and wrinkles. For hyperpigmentation, retinol sloughs those areas off and curbs the production of melanin associated with age spots. What's more, retinol reduces the appearance of acne by unclogging pores and fading acne scars. Retinol is truly a versatile skin care ingredient that most women can benefit from. Prescription retinol tends to be 100 times more potent than over-the-counter retinol-containing products. 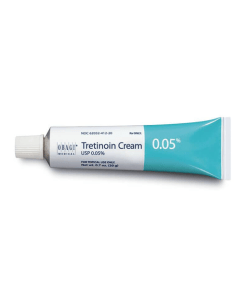 Dermatologists prefer to prescribe tretinoin and retinoic acid for aging skin. With prescription retinol, women notice smoother, more even-toned skin within six-to-eight weeks. 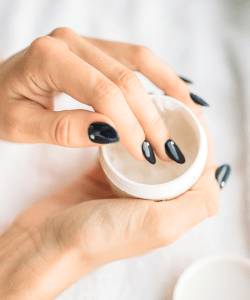 Over-the-counter skin care products containing retinol, however, take about three-to-six months of daily use before women begin noticing a difference. If you're between 20 and 40 years old, you might benefit from over-the-counter skincare products containing retinol rather than prescription ones, since they tend to be milder and safer for sensitive skin. Older women that want dramatic results should consider prescription retinol, specifically retinaldehyde. How do you use retinol? Because retinol is so potent, you only need to use a pea-sized amount each day. To start, you should use a skincare product containing retinol every other night until your skin builds up a natural tolerance. You might notice that your skin is slightly red or irritated the first two weeks of using retinol. This usually subsides within three weeks. 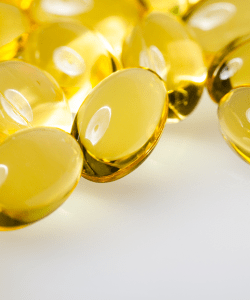 If you're using a prescription retinol, you should use it exactly as prescribed. While using retinol products, it's important that you avoid sun exposure. Always wear sunscreen with an SPF of 30 or higher, and cover exposed skin with protective clothing when you're outside. Prior to applying retinol, you should clean and dry your skin. 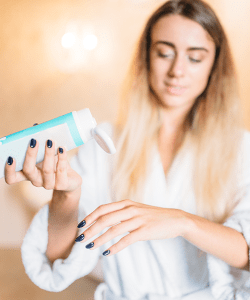 Make sure not to use it with other skin care products such as benzoyl peroxide, sulfur, resorcinol, or salicylic acid, which can cause severe skin irritation. This night cream is crafted with a fast-acting retinoid, a time-released retinol, and a retinol booster to quickly and visibly minimize lines, wrinkles, and crow's feet. What's more, the red algae extract found in this cream boosts skin's firmness and elasticity. This intensive anti-aging cream is clinically proven to reduce wrinkles in one week, delivering smoother and more radiant skin. Formulated with hyaluronic acid, this cream leaves your skin ultra-hydrated and plump. This skin care treatment combines potent antioxidants, extracts, and retinol to diminish fine lines and wrinkles and even out skin tone. What's more, it firms skin, boosts cell regeneration, stimulates collagen production, and refines pore size. This night serum uses revolutionary retinol-infused Smart Drone Technology to achieve smoother, firmer, and more radiant skin. It also contains a unique peptide complex to hydrate and repair skin, and licorice extract to soothe skin. This water-free solution contains a 2% concentration of an advanced retinoid active complex called Granactive Retinoid that has been shown to reduce the appearance of fine lines and wrinkles, increase collagen production, and even out skin tone. This serum penetrates deep into skin's surface to deliver visible results. It's formulated with hyaluronic acid and retinol to smooth skin and fade the appearance of deep wrinkles while brightening skin. This facial moisturizer is formulated with 2.5% retinol to diminish the appearance of fine lines and wrinkles, improve skin texture and tone, and increase skin's hydration. It's formulated without fillers, fragrances, dyes, parabens, or sulfates. This facial cream is designed for daily use. It erases sun damage, fine lines, acne scars, age spots, and uneven skin tone. This cream is also formulated with hyaluronic acid, vitamin E, green tea, shea butter, and jojoba oil to deeply hydrate and repair skin. Retinol is truly a skin care miracle. It not only diminishes the early signs of aging, but retinol also reduces acne and associated scarring. Anyone can begin using retinol-containing skin care products. Just remember to use it every other day in the beginning until your body builds up a natural tolerance. Within a few months of daily use, you'll notice your skin is more radiant, youthful and flawless. "How Retinol Can Change Your Skin," Birchbox, n.d.
"Retinol Cream: Your Skin's New Best Friend," Oprah, n.d.
"Retinoids for Anti-Aging Skin," WebMD, n.d.
"This is Your Skin on Retinol: Your Complete Guide," StyleCaster, n.d.
"The 11 Biggest Retinol Myths," Allure, August 6, 2013. "The Best Retinoids Under $30," Allure, December 28, 2017.